Many commentators argue that South African top-end wines sell at a discount relative to their international counterparts and a fascinating process is currently under way as producers attempt to discover precisely what price the market will bear – the launch of the. Cabernet Franc 2014 at R15 000 per three-bottle case a recent case in point. Now Gary and Kathy Jordan of Stellenbosch property Jordan have played their hand. Previously, Cobblers Hill was the Stellenbosch property’s generally available top-end Bordeaux-style red while Sophia, also Bordeaux-style, was reserved for sale at the Cape Winemakers Guild Auction. 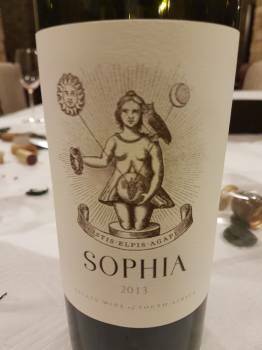 This is no longer the case, however, with Sophia, or at least a version thereof, becoming a standard release, the maiden vintage 2013 currently available at R1 350 a bottle (Cobblers Hill 2014 selling for R380 a bottle). Turns out that a CWG version of Sophia will continue to be made but how different will this be from the standard production wine? Speaking to this, Jordan winemaker Sjaak Nelson insists that there are small but significant differences between the two wines. For the record, the 68 cases of CWG Sophia 2013 sold on the 2016 auction fetched a high of R6 800 per case, a low of R4 800 and an average of R5 241 (equivalent of R873.50 a bottle). On reviewing the wine in a blind tasting prior to the auction back in September 2016, I gave the wine a score of 94 on the 100-point quality scale (see here).